handmade clothing & jewelry // prints and zines // tarot // nail art // styling // ceramics // decor // live caricature drawing // face painting // & MUCH MORE!!! Come feel the night air surrounded by tons of rad art, special goods, sly tunes and magical people ONE NIGHT ONLY! Live music performances by MAYA SONGBIRD (https://m.soundcloud.com/mayasongbird) & JUDITH HORN! -Learn to make shrinky dinks with ROCK PAPER SCISSORS Collective! -Make your own minizine with THE GRAND NEWSSTAND! - Invisible Pony - nails!!! - Obsidian Moon Astrology - star charts & goods! - ToroLuna by Luna Francesca Gomez and Eduardo Valadez Arenas - prints and succulent pups! 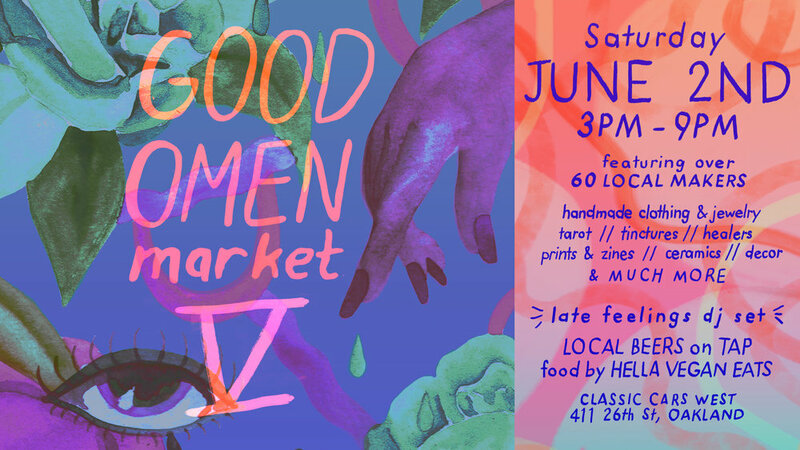 A one day handmade marketplace presenting Bay Area artists and makers! - ARA JO - Tattoos from special edition flash sheet! - Lauren Corden - Photobooth with props!